Schenley Park is the scene of one of the area’s largest and most unique car shows. The Pittsburgh Vintage Grand Prix stages an International Car Show – a combined show of over 2,000 cars. It’s an weekend show open to anyone – no invitation is needed. All makes, all years, all countries, including the U.S. are welcome, whether or not you’re with a car club. You’ll be a part of the show with the best parking spot all weekend to watch the vintage races on the streets surrounding the golf course. Shine up your ride and be a part of the show! Open to all cars of all years. 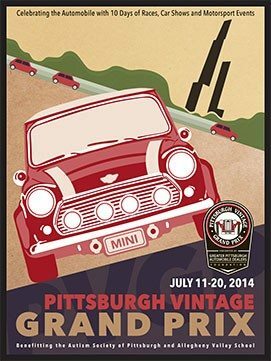 Join the team from Heacock Classic at all the events during the Pittsburgh Vintage Grand Prix!